This ABAP tutorial shows how to display import errors on SAP Transport Management System using import logs or import history for specific transport request number. To figure out what caused the transport request import error, ABAP developers can follow the below methodology in given order. 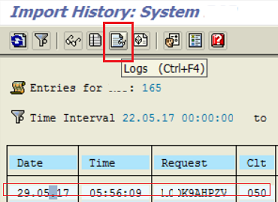 From the Transport Management System menu follow menu option Overview > Imports to see the logs recorded about the specific failed import for the productive SAP system. When the all import queues are listed, find the related SAP system queue in the list and highlight it. Then using Ctrl+F7 or "Import History" icon button, launch and display the transport requests list in the import history for the selected SAP system. Now you can see the transport requests imported to the SAP system and showing the SAP system import history with return code for the health of the transport request import process. You can filter the problematic import requests by using the red icon in RC column. 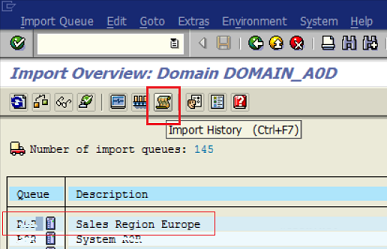 Then click on the Logs icon and display import logs for the transport request in that SAP system. A log overview screen will display a detailed list of steps regarding the import process for the SAP transport request. Click on the Logs icon as shown in the above screenshot and go more details into the program code lines where the error occurred.